The Archives of the Polish Academy of Sciences (the PAN Archives) works to collect, preserve, study, and offer access to source materials that document the history of Polish research. The collections of the Poznań Branch of the PAN Archives are of considerable import for the 19th and 20th-century history of science in the Wielkopolska (Great Poland) region, centered on the city of Poznań. The Poznań Branch of the archives was originally set up in 1956 as a Division of the PAN Archives in Warsaw, and the institution is therefore now celebrating its 50th jubilee. The institution’s first director was a historian, Dr. Kazimierz Ślaski. From 1964 to 1972 it was led by Dr. Jan Szajbel, who was especially noteworthy among the Poznań academic community as secretary of the team that worked to establish the Poznań Branch of the Polish Academy of Sciences. Since 1972, the archives’ Poznań Branch has been headed by Dr. Anna Marciniak. 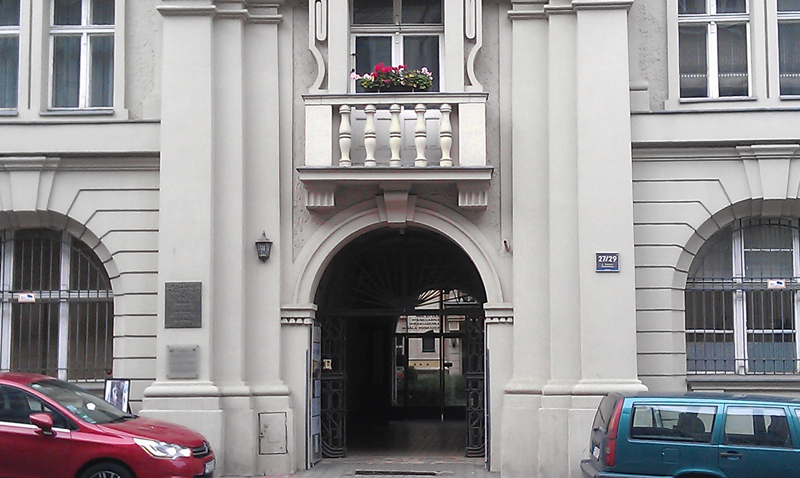 The branch of the archives was first headquartered at the Library of the Poznań Friends of Science Association. It took in its first archival materials in 1957 – these were typescripts of works by Prof. Zygmunt Wojciechowski, director of the Western Institute. The same year likewise saw the first the purchase of materials: the papers of Antoni Wróblewski, the dendrologist and director of the gardens owned by the Kórnik Foundation. In 1958 the Poznań Division of the PAN Archives moved to become housed in the building of the PAN Library in Kórnik. Since its inception, the Archive Division has played an active role in the academic life of the city of Poznań, earning a solid reputation among research and archival establishments. Since 1974, the Poznań Branch has been centered at its current headquarters, the building of the Poznań Friends of Science Association, erected in 1857. The Poznań Branch of the PAN archives gathers materials of private origin, encompassing the private archives of scholars in Poznań and the Wielkopolska Region, and also preserves the records of Academy institutions and other research establishments. The archive collections are open to the research staff and students of Poznań’s higher education institutions, to domestic and foreign research communities, and to individuals interested in the scholarly history and achievements in the region. The branch’s resources are likewise accessible on a questionnaire basis, whereby its staff members seek source information on behalf of patrons. Moreover, the Branch oversees the archiving and proper preservation of records at all the PAN institutions in Poznań Kórnik, and Borowiec. The branch’s staff popularizes knowledge about the history of science by organizing numerous exhibitions and conference appearances, by producing articles and source publications, and recently by posting Internet materials. The resources of the Poznań Branch currently encompass some 4,000,000 documents. These materials are gathered in 156 record-sets, of which 140 are of private origin (i.e. collections of scientists’ private papers), the latter forming the core of the archival records. The interests of the researchers concentrate on such documents attesting to the legacies of preeminent researchers, which were acquired through years of efforts, via purchases, donations, and deposits. The most extensive such record-sets document the legacy of such humanists as Prof. Józef Kostrzewski, a member of the Academy and the discoverer of the unique archeological site at Biskupin, and the historians Bronisław Dembiński, Zdzisław Grot and Witold Jakóbczyk (who studied the Wielkopolska region), Kazimierz Kaczmarczyk and Father Stanisław Kozierowski, as well as the three Academy members: Henryk Łowmiański, Kazimierz Tymieniecki, and Zygmunt Wojciechowski. Noteworthy among the voluminous law-related materials are the records of such professors as Tadeusz Cyprian, Janusz Deresiewicz, Witold Maisel, Antoni Peretiatkowicz, and Bohdan Winiarski. The Academy archives likewise preserve the materials of such preeminent physicists as Roman Pollak, Stefan Saski, Stefan Vrtel-Wierczyński (director of the National Library in Warsaw in 1937-1945), and Jerzy Ziomek. Another valuable set of records comes from the English studies scholar Stanisław Helsztyński (1891-1986), who in 1966 systematically began depositing his manuscripts and correspondence with the archive branch in Poznań. Likewise included are numerous literary autographs, including the entire literary heritage of Polish playwright Stanisława Przybyszewska (Przybyszewska’s works were rediscovered in the 1980s, when director Andrzej Wajda filmed his Danton based on her play). One segment of the collection consists of the records of professors from the Agriculture and Forestry Department of Poznań University (later the Poznań Agricultural Academy), including such outstanding figures as Felicjan Dembiński, Bronisław Niklewski, Wiktor Schramm, Feliks Terlikowski, Tadeusz Vetulani, and Karol Zaleski. Noteworthy among the natural science records are the personal papers of such world-famous Polish researchers and Polish Academy of Science members as the astronomer Józef Witkowski and the mathematician Władysław Orlicz. Valuable materials for history of environmental protection in the Wielkopolska Region and Poland at large are likewise to be found in the collected papers of Professor Adam Wodniczko and Helena Szafran. The medical sciences, in turn, are represented by the collected archives of Franciszek Chłapowski, Heliodor Święcicki (the first president of Poznań University in 1919-1923), Józef Jankowiak, and also voluminous materials gathered by Prof. Adam Wrzosk, the historian of medicine and a collector of source materials on Polish science, the first dean of Poznań University’s Department of Medicine in 1920-1922. The archive preserves the personal papers of 17 Academy members who worked or resided in the Wielkopolska Region, including eight presidents of Poznań University and seven heads of the Poznań Friends of Science Association. Research at is also pursued by the staff members of the Poznań Branch of the archives, who in the institution’s 50-year history have published hundreds of works and articles about the history of science and scholarship, biographies of scientists, and catalogs of the archival collections.